Precision Simulator 10.76 update is available free of charge. Aerowinx Operations Manual 2017 is available free of charge. Aerowinx Nav Database Update for 2019 (using AIRAC cycle 1903) is now available. New weather radar graphics system is available as a bonus for nav database customers. This tutorial deals with initial questions about layouts and control assignments, and describes the creation of a "Situation" for an extremely brief introductory flight. The zip file includes a 64-page PDF and a PSX situation file. The second tutorial fills in some additional background which may be needed by those simmers who are new to PSX. 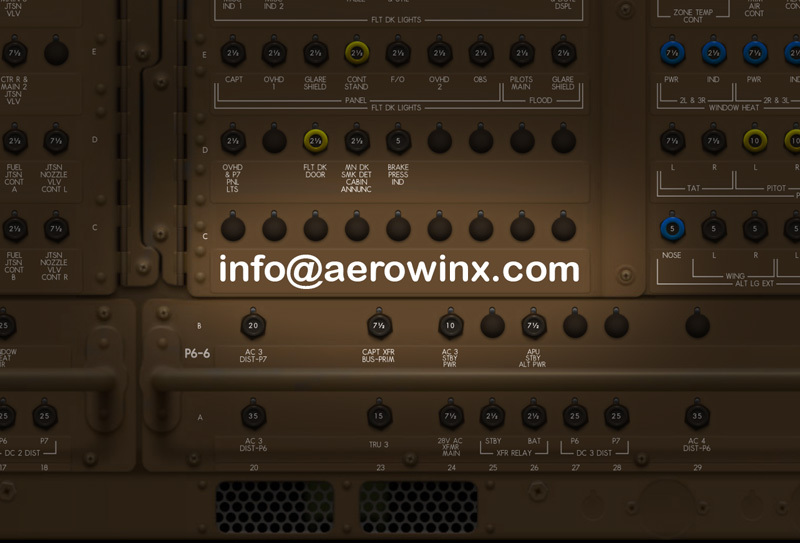 It deals with using flight planners to plan a route for PSX (using PFPX with TOPCAT, and other methods); it also includes a summarised checklist for Situation creation; and discusses options available, and actions required, when creating a bespoke 744 Model within PSX. The zip file contains the 54-page pdf, an example of an Operational Flight Plan produced by PFPX, and a printer-friendly pdf version of the summarised 'create a situ' list. The third and final part discusses in more depth the issues encountered when integrating PSX and FSX (or P3D possibly) into a single coherent flying experience, using Garry Richards's VisualPSX. Some of the principles involved might even apply to using PSX with X-Plane or other scenery generators. An illustrated introduction of PSX at "Mutley's Hangar" from November 2014. This document is intended to show one possible way to customize PSX layouts. Training Videos by Peter "Britjet"
A series of videos on the 747 operation, using PSX. Created by a retired 747 captain and type-rating examiner, the videos mainly deal with procedures and explanations which you may not find elsewhere.